Few days ago, a video showing the moment a young lady was seen allegedly stealing items including drinks, food, glass cup at a recent party, emerged online and immediately went viral on social media. The Lagos State ACP, Yomi Shogunle, even took to his Twitter page and declared her wanted after the video clip went viral. 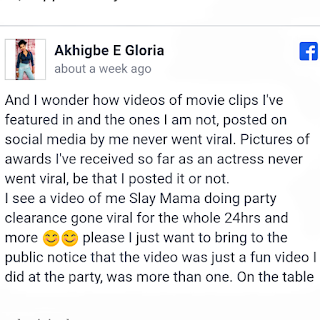 It has just been revealed that the lady is an actress and identified as Akhigbe E Gloria, as she has taken to her Facebook to react to the viral reports, saying that she was only acting as people around her were aware that a video was going on. 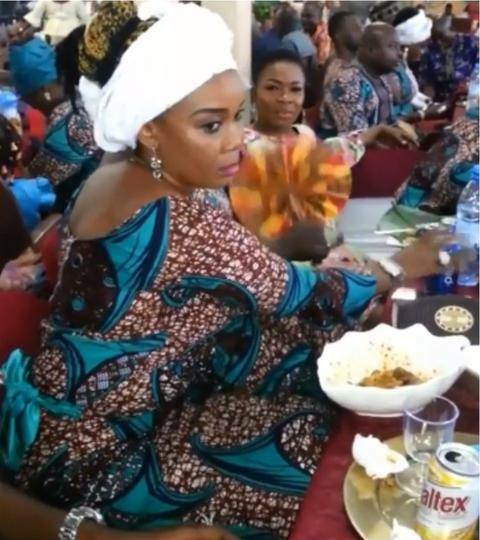 She further revealed that other top Yoruba actresses who shared the same table with her, were aware that she was being filmed. 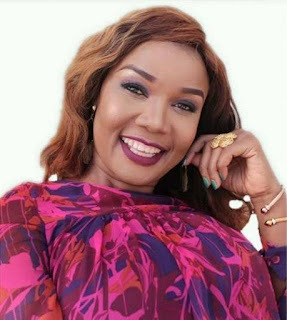 The self acclaimed actress who was not happy about people who believed that she is a thief, said she has received several awards but the pictures did not go viral, only for her to be acting at a party and everyone had something to say. She wrote: "And I wonder how videos of movie clips I've featured in and the ones I am not, posted on social media by me never went viral. Pictures of awards I've received so far as an actress never went viral, be that I posted it or not. 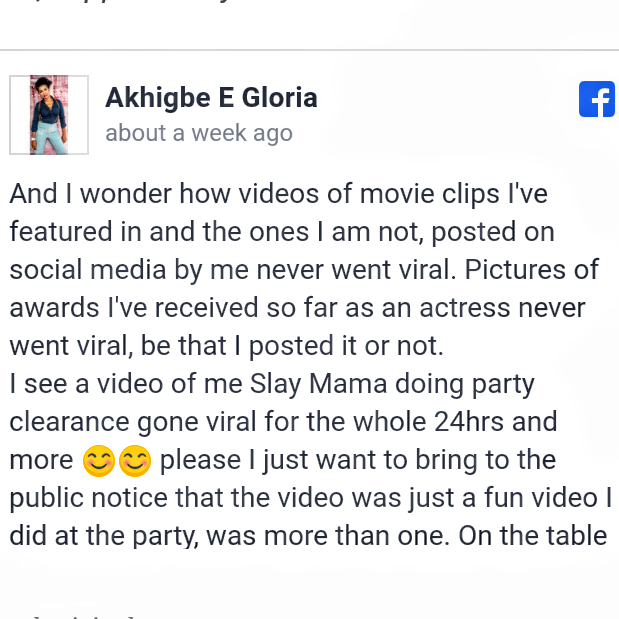 "I see a video of me Slay Mama doing party clearance gone viral for the whole 24hrs and more, please I just want to bring to the public notice that the video was just a fun video I did at the party, was more than one. On the table this video was recorded were top actresses and actors that saw me doing my thing, Aunty Keji Yusuf(sitting opposite me, bursting with laughter), Efe Orhorha(my PA on the left acting up with me) Ireti Osayemi Bakare, Bakare Adeoye, Korede (whose father's burial we were at) Bose Joseph, Delola Fadipe(owner of the hand fan I cleared) etc. 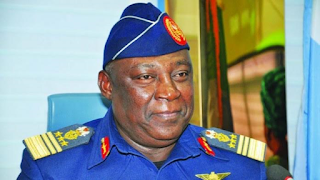 "if you listen well you'll hear people laughing, the laughter was because of the video, ejo make una no pure sand fi mi Indomie o, Please I am not Omo oju o ri ola ri o, was just a fun time video. That video is not the only video sef and I go dey do more now as I see as so. To the person that trimmed the video, thanks you try. Thanks to friends and family that knows me so well, I appreciate your concern."